In order to write a good story, you need to be able to get yourself into a proper headspace. Every writer has their own headspace and their own way to get there. For me, a big part of it is music–particularly scores (soundtracks) from movies and TV. 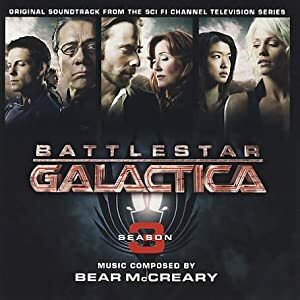 While recently re-watching the entire run of Battlestar Galactica, I became fascinated by the score. So after a bit of digging, I found that the entire score by Bear McCready had been released on CD. I have seasons 1-3 already. I’ll be picking up season 4 when I have the chance. If you haven’t sat and listened to this man’s work, you’re missing out on some amazing and powerful music (he has samples on his site and updates on new projects on his blog). As the Trilobyte Project advances, one of the things we’ll be looking for is a stable of composers who can support and enrich the experience for the viewers. Beyond that, however, we’d love to find musicians who can also create music which, when separated from the show, stands entirely on its own.